For the second day in a row, the Liberty Flames broke open a tight game with a big eighth inning to ease past the Longwood Lancers, 13-4, Saturday afternoon at Charles “Buddy” Bolding Stadium. Just like Friday night where Liberty scored seven runs in the eighth to put the game away in its 20-7 win, the Flames did the same in the eighth this afternoon. Leading 5-3, Liberty saw the first eight hitters of the inning reach, en route to plating eight runs to blow the contest open on the way to the victory. Liberty, winners of three-straight games, moves its Big South mark to 11-6 and overall record to 25-15. Longwood drops to 5-12 in conference and 13-28 overall. D.J. Artis had two hits and belted his fifth home run of the year in the contest. The center fielder drove in three runs and scored three runs. Fellow outfielder Jake Barbee collected three hits and also drove in three runs, while second baseman Andrew Kowalo also hit a home run for the Flames, his fifth of the year. Liberty jumped out to a lead in the top of the third. With one out, a fly ball to center field off the bat of Artis dropped between Lancer left fielder Antwaun Tucker and center fielder Sammy Miller and was ruled an error. Third baseman Trey McDyre followed with a single to score Artis for a 1-0 advantage and Barbee sent a double off the wall in center field for a 2-0 lead. The Flames added to their advantage in their next at bat. With one out in the top of the fourth, right fielder Will Shepherd and catcher Payton Scarbrough each drew walks. Two batters later, Artis drove a 2-1 pitch over the right field wall to give the Flames a 5-0 lead. In the bottom of the inning, Longwood got on the scoreboard with a run. Shortstop Michael Osinski opened the home half of the fifth with a single and third baseman Alex Lewis walked. First baseman Justin Mitchell followed with a single to plate Osinski and make it, 5-1 Flames. The host Lancers cut into the Flames’ advantage in the sixth. Osinski and Lewis walked to lead off the home half of the sixth. After both runners moved into scoring position at second and third, right fielder Ryan Shull lined a two-run single into center field to close within two at 5-3. Liberty took a commanding lead with its eight-run outburst in the eighth. The Flames scored their first six runs of the inning without recording an out. Kowalo led off the inning with a blast over the left field wall for the first run of the inning. The next three Flames walked to load the bases and two scored on a double to center field by shortstop Cam Locklear for an 8-3 lead. Two batters later, McDyre plated a run with an infield single. Barbee followed with a two-run single for an 11-3 edge. 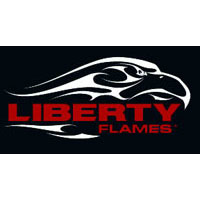 Later in the frame, Liberty scored runs on a ground out by Kowalo and a RBI single by designated hitter Eric Grabowski. Longwood scored a run in the bottom of the eighth for the final score. Liberty starting pitcher Jackson Bertsch moves to 2-3 on the season. The right-hander allowed three runs on four hits over five-plus innings. He struck out two and walked four. Longwood starting pitcher Steven Farkas drops to 0-2. He gave up six runs on seven hits over seven-plus innings. He struck out six and walked three. The Flames outhit the Lancers, 11-7. Up Next: Liberty and Longwood will meet in the final game of their Big South series, tomorrow. Game time is scheduled for 2 p.m.